This book sheds new light on the great significance of children to Christian missions, and of Christian missions to the global reconfiguration of childhood, taking as its focus the Danish Protestant Christian mission in colonial South India in the late nineteenth and early twentieth centuries. Taking an innovative postcolonial history of emotions approach, it reconsiders general assumptions about the history of childhood within the Western world by probing its entanglements with broader imperial developments. Making an important addition to the highly Britain-dominated field of imperial studies, Imperial Childhoods and Christian Mission shows that, like numerous other evangelicals operating throughout the colonized world at this time, Danish missionaries invested remarkable resources in the education of different categories children in both India and Denmark. The book asks: how might interactions between transnational actors in the colonized world have contributed to the contemporary emotional and scientific reconfiguration of childhood? And in what ways did the numerous projects of rescuing brown children from their parents and society help portray imperialism as a benevolent and justified endeavor? 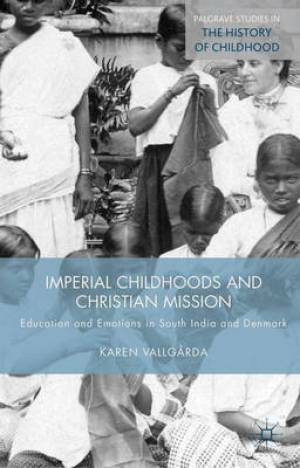 Imperial Childhoods and Christian Mission by Karen Vallgarda was published by Palgrave Macmillan in December 2014. The ISBN for Imperial Childhoods and Christian Mission is 9781137432988. Be the first to review Imperial Childhoods and Christian Mission! Got a question? No problem! Just click here to ask us about Imperial Childhoods and Christian Mission.